The Fugitive, which first crept out of the shadows 50 years ago this month, may be the perfect television drama. That’s not to say that The Fugitive is superior to today’s best dramas, or even to its finest contemporaries, like The Defenders and Ben Casey. But The Fugitive achieved a perfection of form that was unique: It was part crime procedural, part action-adventure, and part character-driven melodrama. It was fusion TV. The push and pull between the contrasting generic elements meant that episodes were highly varied, but with so many different traditions to draw from, nearly always satisfying. The Fugitive achieved a phenomenally consistent level of quality—which makes this a particularly tough list to compile. The Fugitive concerns a miscarriage of justice. Its backstory, chronicled in sound-bite form at the beginning of each episode, is as follows: Dr. Richard Kimble, an upstanding pediatrician in the small town of Stafford, Indiana, comes home one night to find his wife’s bludgeoned body. As their marriage had been on the rocks and there are no other obvious suspects, Kimble is convicted and sentenced to die. Freed by a train derailment on his way to death row, Kimble wanders the country under a series of aliases, working menial jobs and trying to blend in. Kimble’s only hope of turning his temporary reprieve into a permanent one is to find the man whom he suspects of having killed his wife: a one-armed drifter he saw running from his home on the night of the murder. The networks’ failure to grasp how compelling The Fugitive would become underscores the extent to which it broke new ground. It was the first television show about paranoia—the first whose protagonist was always looking over his shoulder—and perhaps the first that rested on an understanding that our social institutions can make mistakes that ruin lives. In an oblique way, The Fugitive channeled the social unrest of its time. It “spoke for a whole generation of people—kids like me, who grew up feeling slightly alienated from our parents,” wrote Fugitive fan Stephen King. Even though cunning criminals had been getting away with murder for nearly a decade on Alfred Hitchcock Presents, the notion of a protagonist in a weekly series remaining permanently at odds with the law was revolutionary. One ABC executive called the premise “a slap in the face of American justice, week after week.” In that sense, The Fugitive is an important antecedent to the anti-hero cable dramas of the present day—even though Kimble himself, one of television’s great white knights, was anything but anti-heroic. The series went to considerable lengths to emphasize Kimble’s unwavering virtue. At the end of the pilot, as he slinks off into the night, Kimble even picks up a mewling stray kitten and gives it shelter in his coat. On paper, gestures like that one might seem to pander to the audience. In practice, they enriched the central irony that drove the series: Each week Kimble managed to solve some stranger’s problems, but never his own. A guy who invariably stops to help an old lady cross the street in the middle of running from the electric chair might seem to strain credibility, right? What saved The Fugitive from absurdity was casting. David Janssen, a Clark Gable lookalike and former Universal contract player, had become a minor TV star in 1957 in Richard Diamond, Private Detective, part of a short-lived television fad for “jazz private eyes.” Too awkward to really succeed as a straight-arrow leading man, Janssen was waiting his turn for character parts. When he took on the role of Richard Kimble, he was only 32 but looked at least a decade older; although his purported alcoholism was not yet crippling, it would be by the end of The Fugitive’s grueling four-year run. As Kimble, he spoke in a staccato grumble, keeping his body taut and ready to bolt, his gaze on the ground or aimed at the nearest exit. If the scripts foregrounded Kimble’s nobility, Janssen’s expressive face filled in all the rest: the fear, the weariness, the exasperation of a life on the lam. Janssen kept The Fugitive anchored in an essential naturalism. Once a member of the intellectual class, Richard Kimble now worked as a bartender one week, a field laborer the next. He was one of the few TV characters seen doing manual labor on a regular basis, and Janssen was one of the few TV stars unglamorous enough to pull that off. The aspect of The Fugitive that was the most ahead of its time was its villain. At best, the police in The Fugitive resemble the police in the films of Alfred Hitchcock (who had been famously traumatized by a childhood stint in a jail cell): unsmiling, implacable automatons. But The Fugitive went beyond that, often revealing the cops in pursuit of Kimble to be corrupt or sadistic. And Lt. Gerard—played with terrific control by Barry Morse—is a flat-out psycho. Hiding behind the excuse that he’s only doing his job, Gerard is clearly in the grip of an obsessive personal vendetta. Capturing Kimble is all about proving himself right and getting revenge on the con whose escape made him look stupid. Not incidentally, Gerard is a complete prick: He neglects his wife and child, and he’s always snide and condescending toward the local cops who tip him off on sightings of Dr. Kimble. “Lt. Gerard really scared me as a kid,” wrote Stephen King. “Kimble had made him crazy, and as The Fugitive went on you could see him heading further and further into freako land.” If Kimble is a far cry from Walter White, Lt. Gerard is only a few steps away from Vic Mackey. 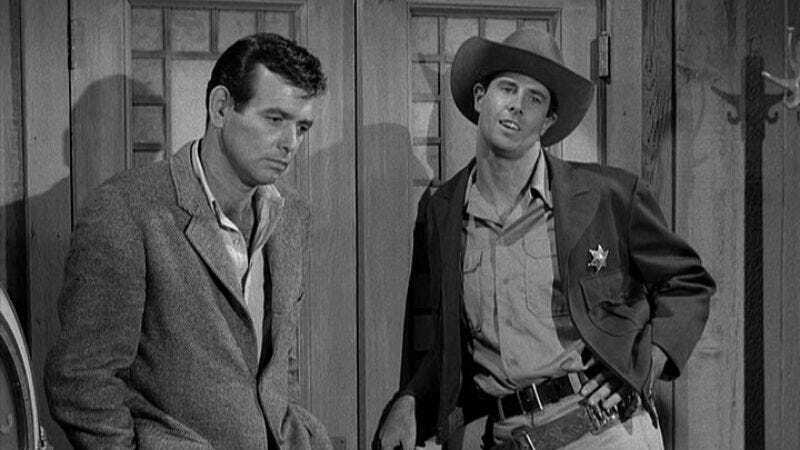 Although it generally operated on the semi-anthology format devised by early dramas like Route 66—shows that devoted most of their screen time to the weekly guest stars, with the regular characters taking on almost secondary roles—The Fugitive gradually sketched in details about Kimble’s and Gerard’s families and various other figures connected to the Kimble murder trial. It was one of the first dramas to construct a mythology, although by today’s standards The Fugitive’s was rudimentary. Recurring characters were sometimes renamed, recast, or forgotten altogether. Perhaps because the television writers of the era weren’t accustomed to this kind of storytelling, some of the series’ milestone episodes are among the weaker entries—like “The Girl From Little Egypt,” the disappointing origin story that chronicles the Helen Kimble murder in flashback, or “Landscape With Running Figures,” the two-parter that pairs Kimble with a temporarily blind Mrs. Gerard. As a result, these recommendations favor the stand-alone episodes that were the show’s strong suit. “Fear In A Desert City” (season one, episode one): The series lays out its premise with admirable economy in its first-rate pilot, which has the gallant Kimble risking capture to defend an abused wife (Vera Miles). Walter Grauman, who was more responsible than anyone else for the QM Productions house style, directs with silky-smooth force, and Brian Keith turns in a terrifying, unforgettable performance as the drunken wife-beater. Martin’s dedication to putting production value on the screen meant that The Fugitive has more expensive guest stars, as well as more outdoor locations and night shoots, than most shows of its era—which makes it that much easier to step into today. “Never Wave Goodbye,” parts one and two (season one, episodes four and five): Worn down to the bone, Kimble considers abandoning his search for the one-armed man and starting a new life with a woman (Susan Oliver, the decade’s most wistful leading lady) with whom he’s fallen in love. The first half of this pivotal episode ends with a 15-minute chase sequence (the series’ best); the second, with a Kimble-Gerard confrontation that sets the tone for their relationship. The only problem (well, apart from Robert Duvall’s dubious Norwegian accent) is that it comes too early in the show’s run—The Fugitive began about a year into Kimble’s journey, but audiences weren’t yet as flight-fatigued as he was—but now that can be remedied by scheduling it further along in the Fugitive viewing experience. “See Hollywood And Die” (season one, episode eight): Inevitably, a man on the run finds himself in the company of other men on the run, and some of the best Fugitives found the Kimble trying to outwit real killers and psychos without the escape hatch—calling the police—that any other TV hero would have. In this one, Kimble is kidnapped by a pair of thrill killers and must pretend to be a seasoned criminal in order to protect another hostage (a young Brenda Vaccaro). The road-trip structure showcases The Fugitive’s signature use of diverse Southern California locations, and in his impersonation of a bad guy, Janssen has a great deal of fun delivering wiseass putdowns from the corner of his mouth. “Where The Action Is” (season one, episode 18): David Janssen was enormously popular with female viewers, and that attraction was echoed in stories that gave Kimble a strong, independent woman as a protector, or a fragile young girl who benefits from his sensitivity. In this one, the bird-with-the-broken-wing is a spoiled rich kid (Steven Bochco’s sister, Joanna Frank) who at first drives Kimble nuts but eventually touches him with her hidden vulnerability. There’s a minimal element of jeopardy when the girl’s well-connected father (Telly Savalas) threatens to expose Kimble, but this is one of many episodes that emphasizes emotion over suspense. “Escape Into Black” (season two, episode nine): Injured in an explosion, Kimble suffers from amnesia—wince!—but wait, this is a devilishly clever high-concept premise from cult filmmaker Larry Cohen (who wrote two episodes). The doctors and social workers who try to help Kimble figure out who he is are actually bringing him closer to capture—and once he’s confronted with the facts of his past, but still has no memory of it, Kimble wonders if maybe he should turn himself in. The series was wise enough to use Gerard sparingly, and the brief confrontation to which this episode builds delivers a great jolt. “Everybody Gets Hit In The Mouth Sometime” (season two, episode 24): Although it was too lavishly produced to capture the feel of the scuzziest low-rent crime movies of the ’40s, The Fugitive was still heavily influenced by film noir. This episode, which places Kimble in the seedy world of short-haul truckers, was an homage to Jules Dassin’s classic Thieves’ Highway (1949). Jack Turley’s unusually cynical script inverted the standard Fugitive formula: The widow (Geraldine Brooks) he tries to help turns out to be a heartless leech, and by the end Kimble hasn’t done anyone much good, least of all himself. “Running Scared” (season three, episode 22): Probably the best of the mythology episodes, this is a claustrophobic, despair-soaked outing in which Kimble learns that his father has died and seeks to share his grief with his sister (Jacqueline Scott, in a recurring role). Gerard, anticipating this meeting and waiting to pounce, never seemed more petty and unfeeling; meanwhile, the viewer learns that the malaise afflicting everyone connected to the Kimble case extends even to the man (James Daly) who prosecuted him, now successful in politics but addicted to pills and despised by his wife. “The 2130” (season three, episode 27): Fugitive historian Ed Robertson called this the series’ “most peripatetic” segment. It’s one of several effective, vignette-structured episodes that illustrate the exhausting whirlwind of Kimble’s flight by having him hop into a different locale, and mini-story, in each act. On hand here are Blade Runner screenwriter Hampton Fancher, playing an oddball hobo, and that great cliché of the ’60s —the Supercomputer! —which Gerard and a vengeful scientist (Melvyn Douglas) use to try to predict where Kimble will next alight. “A Clean And Quiet Town” (season four, episode three): Kimble traces the one-armed man to a corrupt vice town, where he’s living under the protection of the local mob. The Fugitive’s final season saw the departure of its talented original producer, Alan A. Armer, and the unwelcome introduction of color, but this atypical neon noir (written by hard-boiled novelist Howard Browne) makes good use of the show’s lurid new palette. In requiring Kimble to navigate the world of organized crime, this episode is one of the few to suggest that Kimble might be willing to get his hands dirty in order to exonerate himself. It offers a hint of what a more morally ambiguous Fugitive might look like if, for instance, the show were re-made on cable today. And if you like those, here are 10 more: “Nightmare At Northoak” (season one, episode 11); “Home Is The Hunted” (season one, episode 15); “Come Watch Me Die” (season one, episode 17); “World’s End” (season two, episode two); “Nicest Fella You’d Ever Want To Meet” (season two, episode 18); “The Survivors” (season two, episode 23); “Wife Killer” (season three, episode 17); “The Devil’s Disciples” (season four, episode 12); “Concrete Evidence” (season four, episode 18); “The Judgment” parts one and two (season four, episodes 29 and 30). Availability: The complete series was re-released on DVD in a deluxe “Most Wanted Edition” last year. There are also eight smaller half-season DVD sets, but beware —the individual releases for seasons two and three feature extensive replacement of the original underscoring (which was, happily, restored in the complete series box).